Festive family get-togethers at home on the water – it’s what we all dream about, right? Well, designer Stephanie Simmons recently had the opportunity to make this dream a reality for a client on the Eastern Shore. Working on a 1936 house with a recent addition nearly doubling the living space, Stephanie worked from scratch, going room by room, to create an elegant yet relaxed respite for weekends away from the hustle and bustle of everyday life. Using a master plan, Stephanie’s designs included, in the foyer, new black-and-white marble flooring honed to look appropriate to the age of the house, as well completely new updates to the kitchen. A large area that included a dining room with a great room and gathering area beyond, the kitchen touted white cabinets with granite and touches of grey and black. A backsplash of crackled tone-on-tone subway tile above the stovetop added emphasis, and was topped with a coffered ceiling. And if you’ve ever wondered if mixing finishes is OK, let us tell you: it is. We used polished nickel as well as lighting in weathered brass to complete the look. 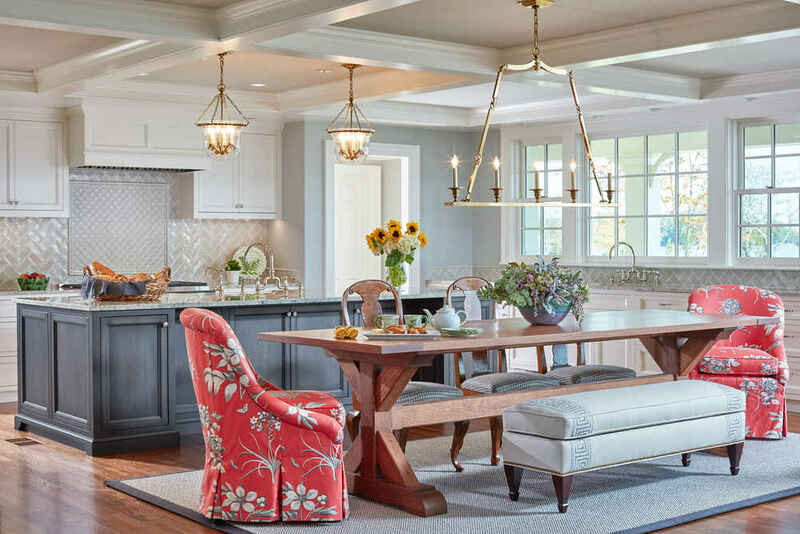 A custom-made table was devised from wood from the property, and side chairs came from Switzerland and were reupholstered for an individualized look. Natural fabrics, linens, and textures were utilized throughout, and while grey is the fashionable “neutral” right now, we accompanied it up with hints of coral, blush, and red in certain areas, and used water tones of blue and aqua in others. The outcome had a continuous flow while not using the same colors all over, making the end result a sophisticated, welcoming home away from home.